In a 21st century musical landscape populated by art rockers, urban realists, hip-hop stars, desktop DJs and bands with axes to grind, there needs to be space for the ingenuous indie pop outfit whose principal policy is to play, to play loud, to have fun and to entertain. Just such a slot was more than adequately filled by Leeds quintet Kaiser Chiefs. Well, initially, at least. Until they developed a social conscience, that is. Over five massive albums — all Top 10 and mostly gold and platinum No.1 or No.2 hits — the Chiefs went from guitar-slinging cheeky chappies to world-weary political commentators. That’s if you pay close attention to the lyrics, of course. The music remains predominantly upbeat and anthemic for the duration, which accounts for the band’s resilient popularity and mega receipts. 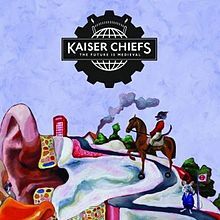 Kaiser Chiefs have notched up combined sales of over three million — Employment (2005), Yours Truly, Angry Mob (2006), Off With Their Heads (2008), The Future Is Medieval (2010), and Education, Education, Education & War (2014). At least two of their singles, ‘I Predict A Riot’ and the No.1 ‘Ruby’, have wormed their way into the public’s consciousness to such a degree they’re on the way to genuine classic status. From the outset Kaiser Chiefs hit the ground running: they swept the board at the Brits in 2006, scooping three awards — for Best Breakthrough Act, Best British Group, and Best Album for Employment. In 2015 they remain one of Britain’s best-loved bands. They have been steadily developing their own agenda too: to play and to entertain, certainly, but also to express their day-to-day concerns via their music, but always via the art of wry observation rather than tub-thumping manifestos. And with frontman Ricky Wilson currently a primetime TV celebrity on the BBC talent show, The Voice, it doesn’t look as if Kaiser Chiefs are about to slip off the radar any time soon. Kaiser Chiefs began as school friends in Leeds, Yorkshire, in 2000, under the name Runston Parva, a deliberate corruption of the name of local village Ruston Parva. Clustered around the songwriting team of vocalist Ricky Wilson and drummer / lyricist Nick Hodgson, with guitarist Andrew White, bassist Simon Rix, and Nick Baines on keyboards, success appeared to come quickly when they were signed to Mantra Recordings. This imprint of Beggars Banquet was home to indie champions such as Gorky’s Zygotic Mynci, Saint Etienne and the Delgados. In the early 2000s, the Britpop sensation of less than a decade before was enjoying a resurgence of interest (if it ever went away) and indie music was once again basking in the sunshine of Pulp, Blur and Oasis. Parva were keen devotees of Blur and openly aped their sound — to the point that when Nick Hodgson met his hero Damon Albarn he quipped, “I hope you’ve not brought your lawyers.” In 2003, Mantra issued three singles by Parva, and an album, 22, titled after the members’ average age and a ‘lost’ Kaiser Chiefs album in all but name. But just as the second wave of Brtipoppers that included Franz Ferdinand, Kasabian and the Killers were storming the charts, Beggars Banquet closed down their Mantra label and Parava were set adrift. Bruised but still brimming with energy and hungry for success, Parva regrouped and soldiered on. “Everything is about the band,” commented Ricky Wilson later. “It’s the most important thing in my life.” But being associated with a failed record label marked them up as “damaged goods” and they decided to rebrand. Nick Hodgson: “We changed the way we play, the way we dress, basically everything we could change without changing our faces.” Keen football fans and supporters of Leeds United, they drew inspiration from their team’s flamboyant centre-back Lucas Radebe, nicknamed “The Chief”, after Kaizer Chiefs, his previous team in his native South Africa. 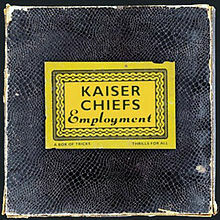 Another deliberate name corruption later and the Kaiser Chiefs were born. With a fresh twist on their robust indie sound, built upon the foundation of punk and new wave topped off with Britpop swagger, they attracted renewed interest from record labels. They eventually signed to B-unique, a start-up indie with acts such as Alkaline Trio and Mull Historical Society on its books. B-unique’s faith in Kaiser Chiefs was well placed, and the band soon became their most successful act. Their first two singles, the rabble-rousing ‘Oh My God’ and ‘I Predict A Riot’, shot into the UK Top 10 in 2004, and their debut album, Employment, issued the following year, was one of the biggest selling debuts of all time, not just in UK indie central but around the world. 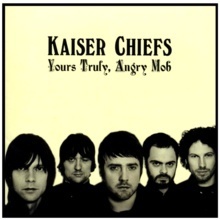 Following a hectic year of touring, Kaiser Chiefs spent just six weeks recording their second album, Yours Truly, Angry Mob, released in 2007 and again produced by Stephen Street. Their already enormous success served to fuel a thirst for even more. “We were looking at some sales figures of Led Zeppelin,” Nick Hodgson told the NME. “The first one did eight million in the US alone. The fourth? Twenty-three million! So we’re like, ‘Yeah!. It’d be great to do that, wouldn’t it?” That was perhaps unrealistic, but Yours Truly, Angry Mob did better the chart performance of Employment in almost every territory and reached No.1 in the UK. Britpop was still an obvious influence musically, but the serious faces on the cover served notice that humour was less of a factor and that, lyrically, social issues were now a concern. The music was predominantly cheery and ferociously upbeat with killer choruses, but irreverence now gave way to irritation and disenchantment. ‘Angry Mob’ addresses misrepresentation in the tabloid press. ‘Highroyds’ reflects upon a Leeds mental hospital that was being redeveloped for housing (which also, incidentally, inspired the title of Kasabian’s third album, West Ryder Pauper Lunatic Asylum). And on ‘Everything Is Average Nowadays’ Ricky Wilson sings “Now you say it’s getting better / but I don’t really see the signs”. Focus on the music exclusively, however, and you’d hardly notice the difference. The album was crowned by the No.1 single, ‘Ruby’, an arena anthem of such ubiquity that it was nominated for an Ivor Novello Award for ‘Most Performed Title of 2007-2008’. It wasn’t until 2011 that fourth album, The Future Is Medieval, arrived. The band had a new label, Polydor, and a new producer, Tony Visconti. In an interview Hodgson revealed that, as they were struggling to complete the verse of ‘Man On Mars’, Visconti texted his old friend David Bowie for help, and Bowie replied, offering “a couple of lines”. But Hodgson rejected them. “I can’t believe I'm saying this,” he admitted, “but they just weren’t right, so I’ve missed out on a Hodgson/Bowie writing credit. Gutted!”. The song was the second single from the album, but it failed to chart. Neither did its follow up, ‘Kinda Girl You Are’. The lead 45, ‘Little Shocks’, meanwhile, despite garnering “one of their best” notices in some quarters, peaked at a resoundingly low No.179. The downturn also applied to the album itself, which reached UK No.10, their lowest placing to date but a success nevertheless. The Chiefs had taken an innovative approach to its marketing, offering fans a customized download of 10 tracks from the 20 posted on their website. There were new influences too: hints of Bowie, perhaps not surprisingly, on ‘Things Change’, Kraftwerk even on ‘Heard It Break’ and a mixture of the Beatles and the Stones on ‘When All Is Quiet’. But in the main, having previously channeled Blur to obvious great effect, for The Future… Kaiser Chiefs turned to Oasis and their ‘difficult’ third album Be Here Now. Said Hodgson: “We all know that record has loads of problems, but at least it’s got an attitude”. Perhaps some of those ‘problems’ rubbed off, as the Chiefs’ trademark ebullience was now replaced by a gloomier perspective. Gone were the irresistible ‘nah-nah-nah-nah-nah’ hooks of old, replaced by a more thoughtful — OK, downbeat — approach. Nick Hodgson sang lead vocals again on the closing ‘If You Will Have Me’, in a moving message to his father which once more invoked the spirit of John Lennon. 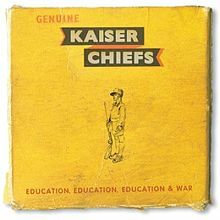 Kaiser Chiefs most recent album is Education, Education, Education & War (2014). The overtly political title is a reference to former Prime Minister Tony Blair and, inside, the band’s by-now entrenched lyrical themes concerning the inequalities of life were again to the fore, alongside a strong anti-war message — and plenty of marching beats. Prior to its recording they received a major upset when founding member, songwriter and drummer Nick Hodgson left the band, citing his dislike of touring and his desire to concentrate on other projects. Vijay Mistry from Leeds band Club Smith took over on drums. There was also another producer, Ben H. Allen III and a new label, Fiction. Reviews were mixed again but despite the setbacks, the album is back to basics for Kaiser Chiefs and it’s bristling with energy and infectious hooks. It also returned them to No.1 in the UK. It opens with ‘Factory Gates’, which revisits the heights of ‘I Predict A Riot’ once again, as does ‘Ruffians On Parade’ and the melodic, ‘Misery Company’, all highlights. Reaching only No.31, the anthemic lead single, ‘Coming Home’, didn’t quite match the success of the album, but was classic Kaisers nonetheless. Unlike the thundering ‘Cannons’ on which flourishes of death metal sit alongside a spoken-word section recited by actor Bill Nighy. Album closer ‘Roses’ is a departure from the main anti-war theme, on which Ricky Wilson’s reflective minor key vocals follows Nick Hodgson’s wistful precedents on the previous two collections. A new direction, perhaps? Inspired by that moment sometime in the late '70s when punk gave birth to new wave (and looked back to the heyday of '60s mod for inspiration), the Kaiser Chiefs' debut, Employment, expands on the sharp, sussed sound of their singles in surprising ways. A look at British life and its discontents, Employment is a remarkably ambitious debut album that aspires, right down to its cheeky liner notes and graphics, to be the Parklife or All Mod Cons of the 2000s. While it doesn't quite reach those heights, it does have its fair share of memorable songs. Chief among them is the one-two punch of "Everyday I Love You Less and Less," a tightly wound "get lost" song that seamlessly mixes the band's punky guitar-bass-drums attack with synths and drum machines, and their signature single, "I Predict a Riot," another prime example of the band's barbed, pissed-off pop. "Saturday Night" is another standout; with its brassy stomp and lyrics like "watching the boys on their motorbikes/I want to be like those guys," it's a Quadrophenia-like understanding of what it is to be lonely in a crowd. On songs like moody-yet-stylish "Modern Way" and the cheeky, contradictory "Na Na Na Naa," the Kaiser Chiefs sound so effortlessly "on" that it's something of a surprise when Employment begins to lose momentum. Despite its pretty '60s pop melody, "You Can Have It All" drags a bit, while the vaudeville-tinged "Time Honoured Tradition" and "Born to Be a Dancer" are too precious and theatrical for their own good. Although it's not among their best songs musically, and its Beach Boys piss-take title is a little annoying, "Caroline, Yes" is one of the Kaiser Chiefs' more interesting bits of songwriting: on the surface, the narrator is upset because the other guy took Caroline away from him, but what really gets him is that the other guy is "everything I want to be in my life." Likewise, Employment ends with "Team Mate," a tantalizingly short character sketch that is also the band's best ballad. The Kaiser Chiefs' ambition is a double-edged sword: it's admirable that they wanted to branch out in so many directions on their first full-length, but it might have been a better -- or safer, at least -- move to stick to the amazing rockers that made their name in the first place. Employment is an uneven but still very promising debut that suggests that one day the Kaiser Chiefs will pull off something even more ambitious. It's no secret that the Leeds-based Kaiser Chiefs love the Jam. The band's 2005 excellent but uneven debut Employment was an infectious salute to all things mod and Brit-pop, boasting three solid singles ("I Predict a Riot," "Oh My God" and "Everyday I Love You Less and Less") that held great promise for future endeavors. On Yours Truly, Angry Mob, the group takes a little more time in establishing its pop acumen, offering no immediate pay-offs despite its insatiable thirst for FM melody. Opener and first single "Ruby," a rowdy, mid-tempo singalong that gets everything right but feels a little tossed-off and disposable, is indicative of Angry Mob's first half -- "Heat Dies Down," "Love's Not a Competition (But I'm Winning)" and "Highroyds" have all of their cogs well-oiled and reliably dressed, but there's nothing here that warrants the inevitable second listen in which a perfectly constructed pop song's true genius is revealed. To that end, Angry Mob is creatively back loaded (though not genius), relying on a series of rewarding and occasionally subversive tracks like "I Can Do It Without You," "Learnt My Lesson Well," "My Kind of Guy" and closer "Retirement" to avoid the dreaded sophomore slump, revealing a band that is likely to continue pumping out albums with a few great songs on them until the requisite "Greatest Hits" collection arrives. Though "Ruby" was one of the Kaiser Chiefs' biggest hits, it and the rest of Yours Truly, Angry Mob were disappointing, trading Employment's ambitious spark for workmanlike consistency. It seemed like that could be the fate of the rest of the band's output until Lily Allen's funky pop cover of "Oh My God" appeared on Mark Ronson's album Version, which ultimately led to Ronson working on the Kaisers' third album. The golden touch Ronson had as a producer for artists like Allen and Amy Winehouse is also evident throughout Off with Their Heads: he imbues the band's spiky Brit-rock with his pop and dance music flair, throwing together strings, synths, live and programmed drums, exotic percussion and lots of guitars in a new wave-y/rave-y mix that nods to bands like Klaxons and Late of the Pier. The cheeky "Addicted to Drugs" gets an extra kick from Ronson's a go-go bells, giving the song a kinetic beat even though the rest of the track is straight-ahead guitar pop, while "You Want History"'s brisk hi-hats and surging synths flirt with the dancefloor. Ronson also brings in Allen as a guest vocalist for the excellent, slightly paranoid pop of "Always Happens Like That" and rapper Sway on "Half the Truth," who gives the song's angry young man rant against doublespeak a sharper edge.Of course, all the creative production and guest stars Ronson offers wouldn't mean anything if the Kaiser Chiefs' songwriting wasn't focused, but Off with Their Heads delivers on this front too. The band rails against stupidity and conformity like they did on Yours Truly, Angry Mob, but this time they know that while it's smart to be witty, it's even smarter to be insidiously catchy. The band's commentary is fused to some of their most pointed hooks: "Never Miss a Beat" rails against how "it's cool to know nothing" to a fittingly relentless rhythm. "Like It Too Much" touches on the Kaisers' latent XTC fetish -- words like "You are descended from animals/And you are constructed of chemicals" could have flowed from Andy Partridge's pen, and the song's lumbering stomp only heightens the similarity. Elsewhere, "Can't Say What I Mean" is wittily tongue-tied and "Good Days and Bad Days" manages the impressive feat of being happy-go-lucky with sounding complacent; more importantly, they show that the Kaiser Chiefs remember the playful spirit of British rock that a lot of traditionalist U.K. bands forget. A couple of songs lack the urgency of the album's best moments (though "Tomato in the Rain" boasts the great lyric "A policeman on the take/Weighted down in a lake" and "Remember You're a Girl" has a naggingly deja vu-inspiring melody), letting Off with Their Heads fall just short of greatness. Still, this is easily some of the Kaisers' finest -- and most consistent -- music. The fifth long-player from the Leeds-based festival rockers with a penchant for climbing lighting rigs and crafting innocuous, arm-waving anthems that fuse the anthemic scope of classic Brit-pop with the insular, somewhat opaque, progressive cynicism of early-2000s indie rock, begins with the rousing "Factory Gates," a distillation of all of those aforementioned attributes that sounds almost exactly like what is arguably their most well-known song, 2005's "I Predict a Riot." 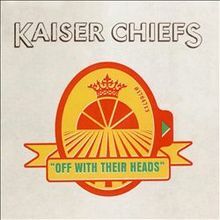 Written in multiple cities and countries and recorded in Atlanta, Georgia with producer Ben Allen, Education, Education, Education & War promises the golden vistas of a new frontier, yet delivers once again the quintessential Kaiser Chiefs album. Even its moniker, a quote from former prime minister Tony Blair, is stuck in the past, but if there's one thing that Ricky Wilson and company excel at, it's being themselves, and this ten-track collection of paeans to permeable dissatisfaction is as much a tribute album as it is a defiant gaze into the abyss. As arena anthems go, you could do a lot worse than the infectious, aforementioned earworm of an opener and the like-minded "Ruffians on Parade," or the propulsive and pugilistic "Misery Company," a wily and willfully melodic ode to self-deprecation that's built around a chorus of maniacal laughter, but they are ephemeral at best. There's a refreshing, devil-may-care cavalier attitude to Education, Education, Education & War that eradicates much of the desperation that was beginning to creep in after 2007's Yours Truly, Angry Mob, but it still doesn't change the fact that you've heard it all before.